Hyperion’s predominantly black‑grey cover is unfortunate, given both the dazzling array of musical colours Bach employs and Arcangelo's brilhantly variegated performances. 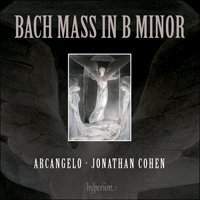 Jonathan Cohen has assembled a talented bunch of musicians ‑ 25 instrumentalists and 25 singers (five soloists, 20 ripienists): they have the individual versatility to exploit the profusion of styles and formats Bach drew on ‑ stile antico to galant, solo voice to double choir ‑ yet also have the collective ethos to maintain an overall sense of cohesion. The solo and duet movements are especially lovely, expressive yet never indulgent: try the flickering chiaroscuro of Neal Davies' peat‑dark bass, Ursula Paludan Morlerg’s gleaming, fat‑toned hunting horn and a pair of bassoons in the Quoniam, or the unearthly beauty of Tim Mead’s imploring alto in the Agnus Dei. absolutely joyous and gloriously colourful. Dont let that cover put you off!